For Eleanor and Malcolm who are on their way to Rome. 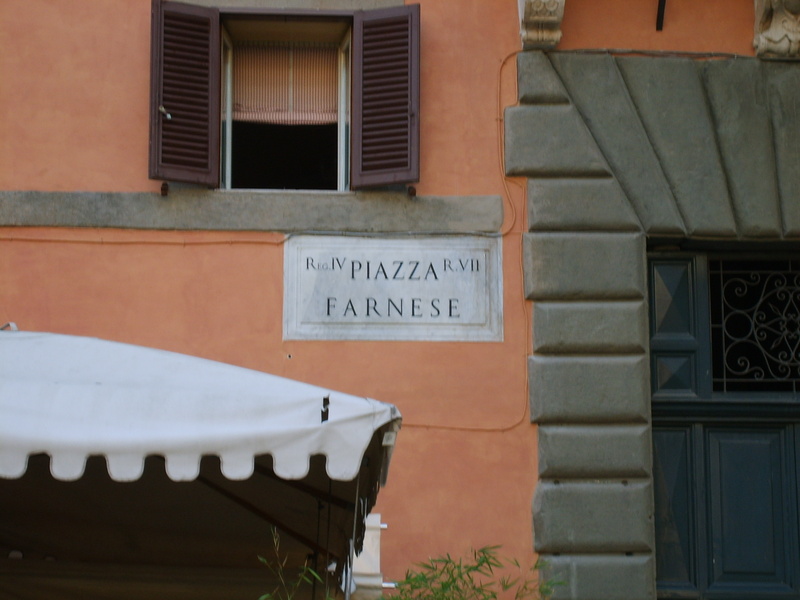 Here is our favorite walk, “off the beaten track,” through Campo de’ Fiori, Piazza Farnese, the Jewish Ghetto and Trastevere. Dear Eleanor and Malcolm: It’s springtime. 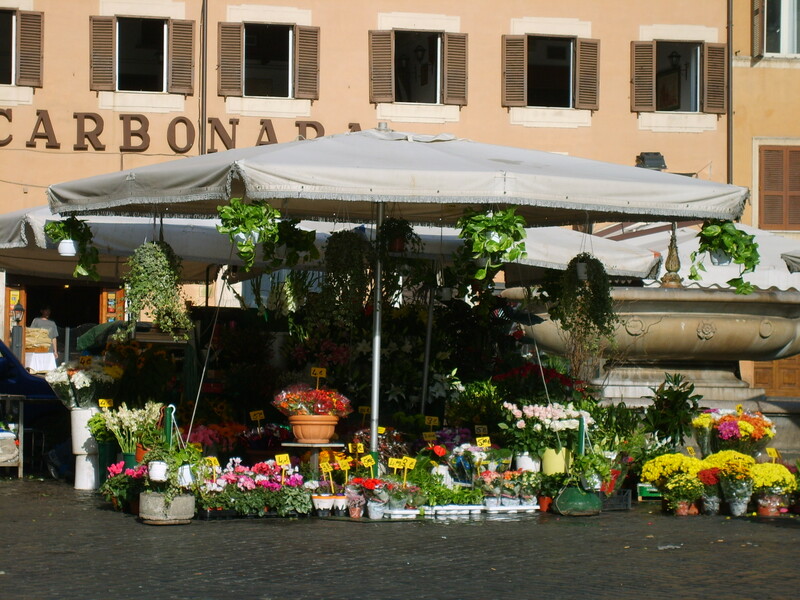 Slip away from the crowds and discover a different Rome starting with Piazza Campo de’ Fiori, a vibrant outdoor market with flowers, fish, vegetables, fresh herbs, fruits and cheeses – among the oldest in Rome. 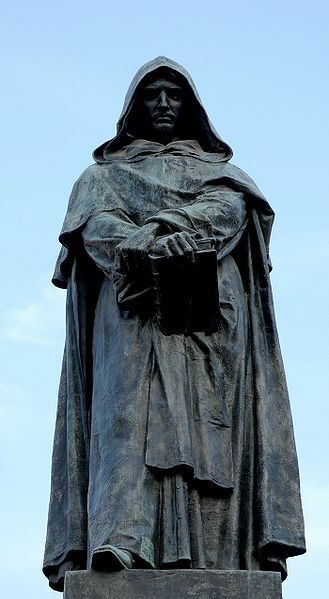 Don’t miss the statue of Bruno, the monk burned at the stake in 1600. Have a coffee and watch the locals, housewives, students, tourists and ne’er do wells crowding the piazza – endlessly fascinating. Do watch your wallet. Walk to the Piazza Farnese, the quiet piazza next door. Fiori and Farnese are like brothers – one rambunctious and colorful, the other solemn and introspective. Piazza Farnese is great when you need some breathing room. It’s perfect after a spat. From Farnese, head down via Mascherone toward the river. Hang a left onto the picturesque via Giulia (top photo and below left), with its hanging vines and ancient stone walls. 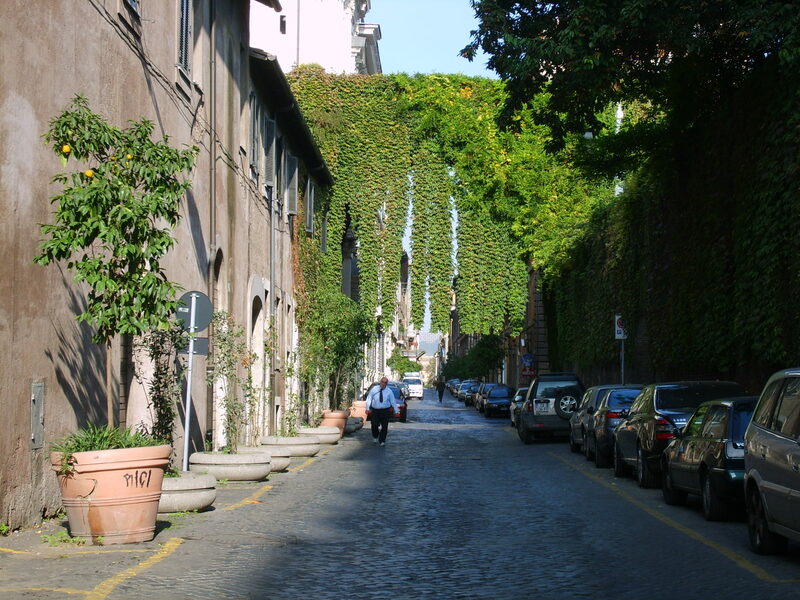 You will emerge on via Lungotevere as you approach the small Jewish Ghetto neighborhood. Don’t miss the recently restored Portico d’Ottavia, Piazza Mattei and Piazza Cinque Scole, where you’ll find the wonderful Sora Margherita restaurant, our favorite. Arrive early and ask Mauro Ziroli for a reservation, or call 066 874216. He will do his best for you. Take a little time to explore Rome’s grand, imposing synagogue – or check out its small museum. If you take the time to explore this wonderful neighborhood, you will leave with an indelible impression of the “sapore” and history of ancient Rome. 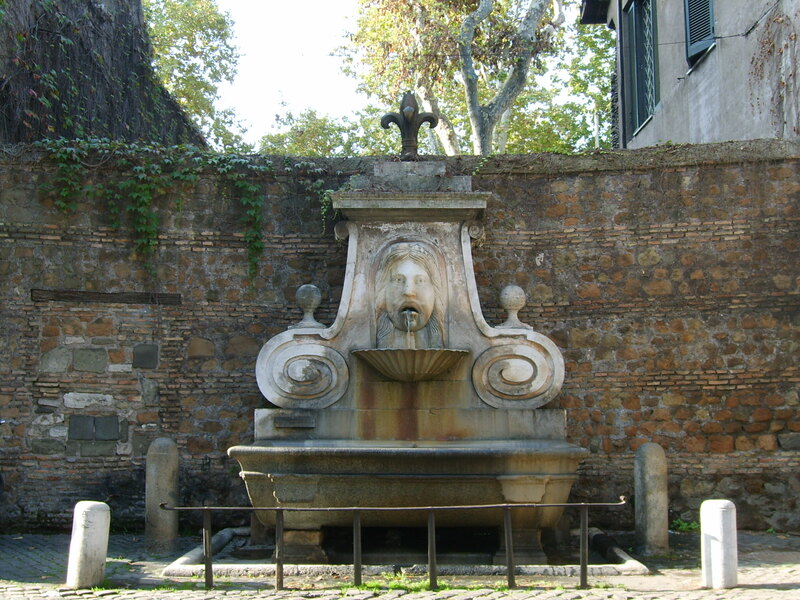 Don’t miss the Fontana Tartarughe (turtle fountain) – my favorite in all of Rome – in the tiny Piazza Mattei. It is very different from the famous Bernini fountains of Navona and Trevi, which of course you must see. But please do not miss the Tartarughe — it is pure delight, a joy. 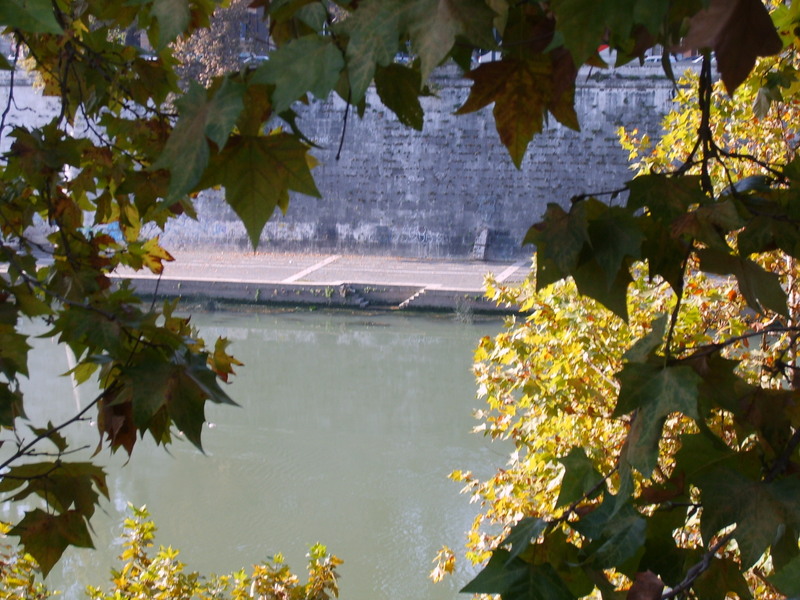 Cross the river via either the Ponte Sisto or Ponte Fabricio to Trastevere. 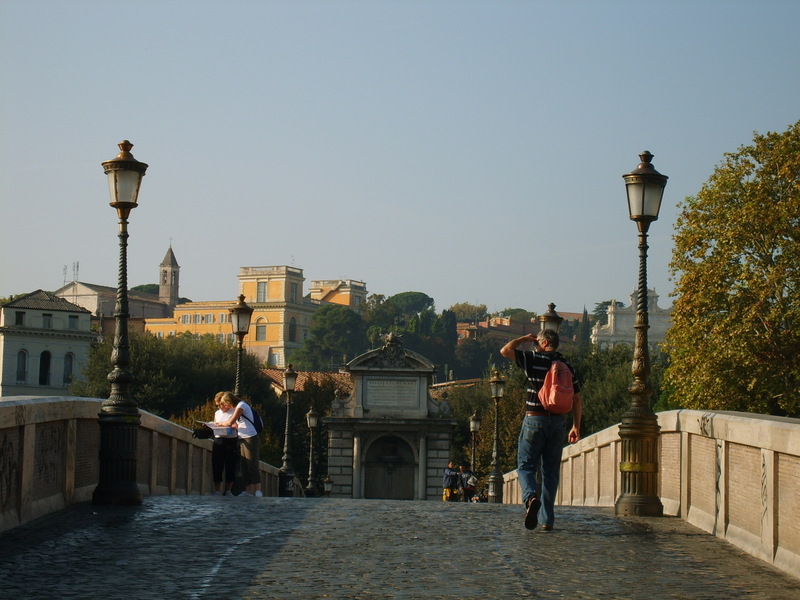 From Fabricio, the oldest bridge in Rome, you will cross a small sunny island, l’Isola Tiburtina. Take a minute and look down the river – and up. Spectacular. Winding narrow streets and medieval architecture give Trastevere a bohemian ambiance – a unique, funky vibe all its own. 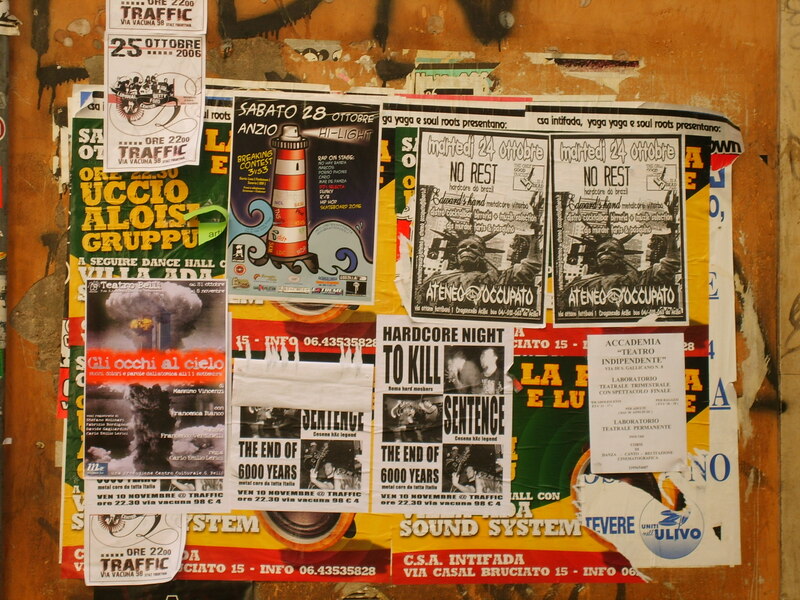 Lately, Trastevere’s beauty has been somewhat obscured by graffiti. I am hoping it has improved for your visit. NOTE: If you begin this walk at the Pantheon and head through Piazza Navona to Piazza Campo de’ Fiori, you will see even more. Me, I always begin and end at the Pantheon. That’s how I tell my soul I am in Rome. But that’s another story . . . This entry was posted in Food and Wine, Italian Travel, Travel and tagged Bernini, Campo de Fiori, Elizabeth Margolis-Pineo, Giordano Bruno, L'Isola Tiburtina, Mauro Ziroli, Piazza Cinque Scole, Piazza Farnese, Piazza Mattei, Piazza Navona, Ponte Fabricio, Ponte Sisto, Portico d’Ottavia, Rome, Rome's Jewish Ghetto, Santa Maria in Trastevere, Sora Margherita, Tartarughe, Trastevere, Trevi Fountain, Via Giulia. Bookmark the permalink. Oh my god, absolutely beautiful and wish I were going along with Eleanor and Malcolm–I’m sure they won’t mind a bit. Thank you for a lovely walk in Rome this morning!